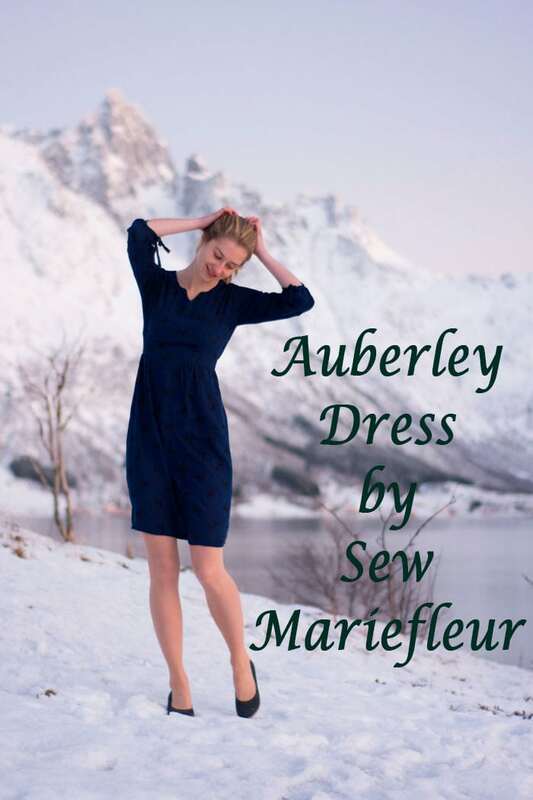 Hi there, this is Fleurine from Sew Mariefleur, and I’d like to show you my Auberley dress. This month’s theme is “re-use” and I’ve been thinking a lot about how to incorporate this theme into my garment. 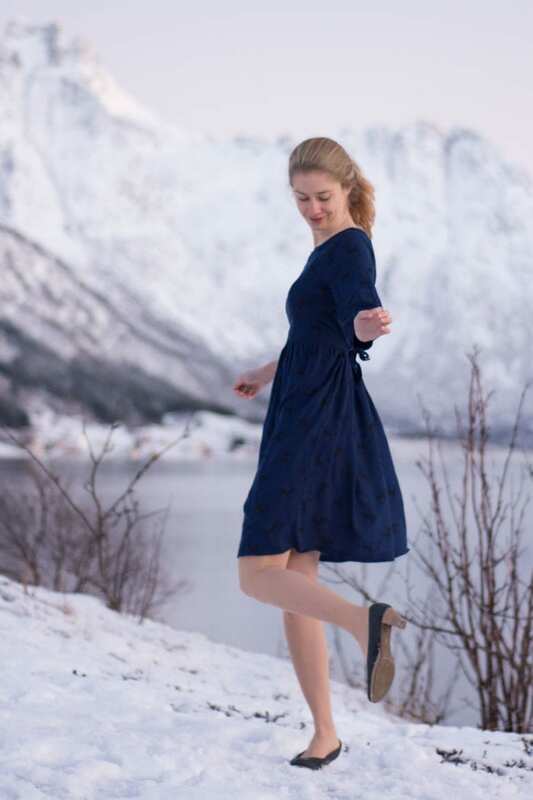 I know I wanted to make an above knee-length Auberley dress with a notched neckline and bishop sleeves, using the hack pack available for the pattern. 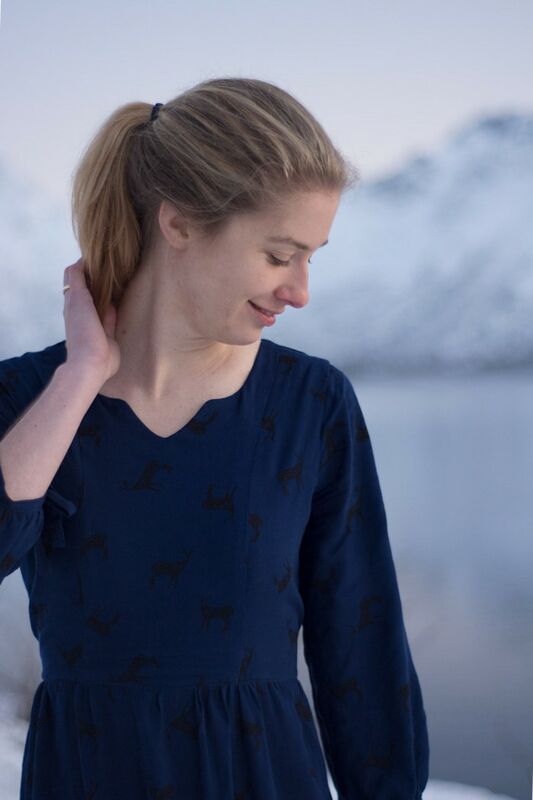 I thought of making the yoke with fabric from a garment I don’t wear that often anymore – the yoke would be perfect for incorporating a fabric you only have a little bit left off or for cutting up your favourite, but worn-down blouse! Unfortunately I couldn't find the right combination of contrast fabric and main fabric, so I decided to make the bodice lining using garments I've made early on in my sewing career and that I don't wear any more. Both tops are made of a viscose fabric that wrinkles a lot and my sewing wasn't that good at the time I made them. 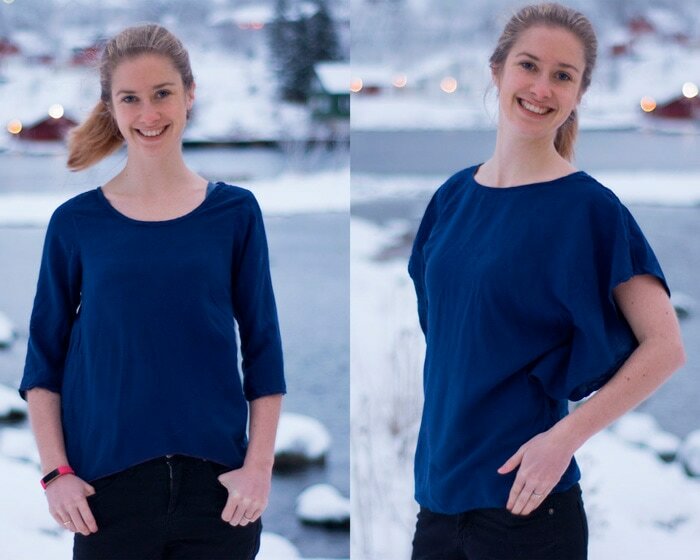 The top on the left is actually a free pattern by Melly Sews, the High Low Shirt, the one on the right is a simple flutter top. And now they serve a much better purpose as a lining for my beautiful Auberley dress! My main fabric is this beautiful rayon from LA Finch fabrics. 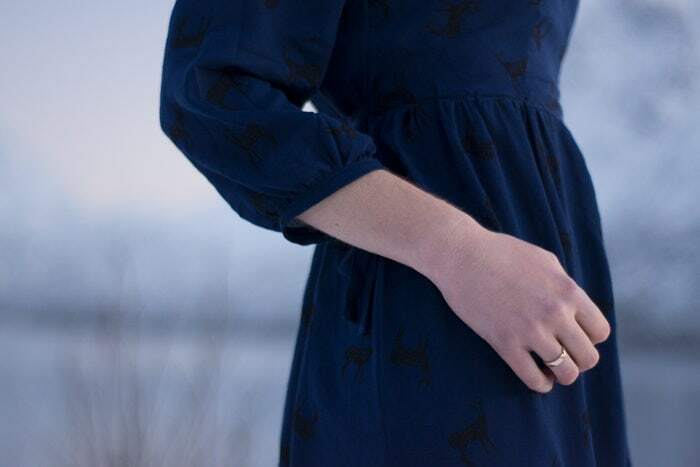 I love the cute deer and how the print is still subtle because of the black print on blue fabric. The fabric is not easy to work with, it's thin and has a loose weave, and you can't really see a grain line. But it's incredibly comfortable to wear! As a result of the challenges while working with the fabric, I have to admit that this dress isn't my neatest make. 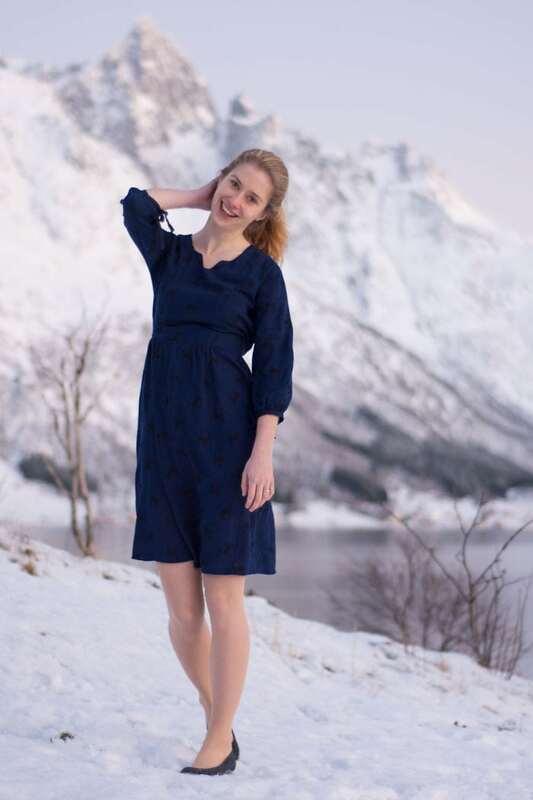 There are definitely some imperfections here and there - but I still love wearing it and it showed me once more that your makes don't need to be perfect in every way for you to be able to love wearing a garment. I feel beautiful wearing the dress and no one I meet will ever notice the wrinkles, buckled stitches and so on. Size-wise I'm in between size 0 and 2, but I decided to make size 2 with no alterations other than lengthening the bodice about 1,5". I expected the bodice to be slightly loose, which I didn't mind, since the fabric doesn't have a lot of structure. But I actually think the fit is really good this way and I'm glad that I didn't grade in between sizes! I also skipped the skirt pockets. Looking at the photos I think I might have shortened the skirt 1" too much, but oh well, it's not like it's inappropriately short! Sewing the Auberley isn't very difficult, I can recommend this dress to anyone who wants to try sewing princess seams and making a lined dress. Since there's a tie at the waist, adjusting the fit of the dress after finishing is easy and thereby the chances are high for getting a very satisfactory sewing result - like I did!